GA International is the industry leader in providing xylene-resistant labels and chemical resistant labels for both thermal-transfer and inkjet printing technologies. The face stock, printout and adhesive of the labels will resist a wide range of solvents, detergents and other chemicals including xylene, toluene, acetone, alcohols, ketones, ethanol, methanol, isopropanol (IPA), isopentane, mineral oil, methyl ethyl ketone (MEK), dimethyl sulfoxide (DMSO), hexane, acetonitrile (ACN), mineral oil, etc. Furthermore, the special surface coating prevents any colour retention on the surface of the labels during histological staining with hematoxylin, eosin, methylene blue, toluidine blue, azure, giemsa stain, Wright's stain, etc. These labels are the ideal labelling solution for scientific pathology laboratories and medical facilities using cytology and histology staining methods. The labels are also excellent for industrial applications that use harsh chemicals in every day processes. 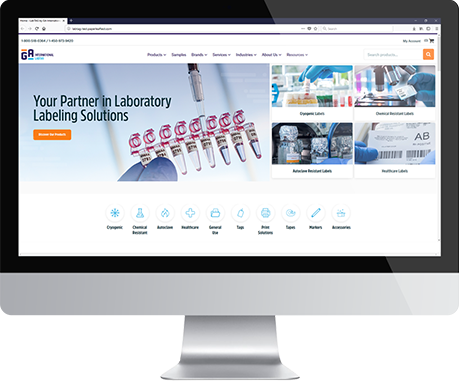 Whether you are labelling lab slides, histology cassettes, drums, chemical bottles or automobile parts, GA International has the largest selection of labels in different sizes, colors and configurations to choose from or customize to specifications. Chemical resistant labels do not require any over-laminating to protect the printed information. They are easy to print using ordinary barcode printers or ink-jet roll printers.If required we can produce custom-made labels of any dimensions and print them with customized information, color logos and images, barcodes, serial numbers and data from Excel sheets and Database. All our xylene & chemical resistant labels are waterproof and weatherproof. XyliTAG™ plastic labels in combination with our chemical resistant TC ribbons (XAR class of ribbons for CognitiveTPG Cxi 2-inch printer)can be printed with thermal-transfer (barcode) printers to produce durable and cost-effective chemical and solvent resistant tags. Ideal for microscope slides. Cryo JetTAG™ matte labels can be printed with inkjet printers to create brilliantly colored labels that are chemical resistant and cryogenic resistant for vials and other types of containers. XyliTRANS™ transparent xylene & chemical resistant labels are ideal for identification of cryotubes and cryovials for cryogenic use.